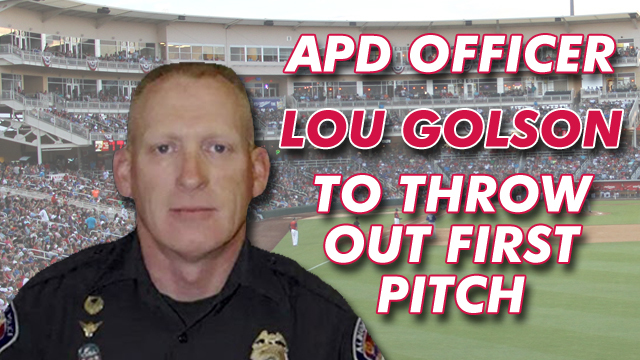 "We are honored to have Officer Golson joining us for Opening Night," Isotopes General Manager John Traub said. "He has been making a remarkable recovery since being shot in the line of duty earlier this year, and we're thrilled he will be able to throw out the first pitch of the 2015 season. We are very thankful for his service to the community as well as the service of all of our military members and public safety officers." A 31-year veteran of the Albuquerque Police Department, Golson also served in the Armed Forces in many different capacities. He's worked a variety of beats at APD, including traffic and SWAT, but recently volunteered to return to DWI Patrol. He was also honored by MADD as a hero awardee on November 8.